Have you noticed that some churches are Immanuel and others are Emmanuel? Have you noticed that some Bibles say both Immanuel and Emmanuel while others only say Immanuel? But they are spelled differntly. One has an “I” while the other starts with an “E”. Well, both can be called “right”, but, in my opinion, one is more accurate than the other. It comes to this: Immanuel is the English translation of the Hebrew “עמּנוּ אל” (‛immānū’ēl) and Emmanuel is the English translation of the Greek “Ἐμμανουήλ” (Emmanouḗl) which is a translation of the Hebrew “עמּנוּ אל“. In my opinion, which you can disagree with without recourse, “Immanuel” is the more correct term as it is a direct translation of the original Hebrew, whereas “Emmanuel” is a translation of a translation. In the beginning was the Word, and the Word was with God, and the Word was God. He was in the beginning with God. All things were made through him, and without him was not any thing made that was made. In him was life, and the life was the light of men. The light shines in the darkness, and the darkness has not overcome it… And the Word became flesh and dwelt among us, and we have seen his glory, glory as of the only Son from the Father, full of grace and truth. Jesus IS Immanuel; God with us! Do you own a Bible? When was the last time you opened it? How many do you own? Do you even know? Below is a video of the Kimyal tribe in Indonesia receiving God’s written Word for the first time in their own language. It is definitely worth the 10 minutes to watch this video. Share it with your friends. The go get your Bible and read it! Athletes, officials, spectators and tourists can pick up the Bible or just the New Testament for free during the Olympic Games next month. Tens of thousands of copies of the Bible, the New Testament and booklets with just the four Gospels (according to Matthew, Mark, Luke and John) have been printed for the purpose, say officials of China’s Christian society. Rev Xu Xiaohong, an official of the Shanghai-based China Christian Council in charge of publishing, says 50,000 bilingual (Chinese and English) editions of the Gospel booklets had already been printed by June. They are on way to six cities hosting the Olympic events in the mainland. As has been the practice at earlier Games, the Gospel booklets will be available mainly in churches and the Olympic Village in Beijing, and in Qingdao, Shanghai, Shenyang, Tianjin and Qinhuangdao, Xu says. Places of worship for people of other religions too have been set up in the Olympic Village, Chen Guangyuan, president of the Islamic Association of China has said. The cover of the Gospel booklet will have the Beijing Olympics logo. Nanjing-based Amity Printing Co, the country’s major printer of the Bible, has printed the Gospel booklets. Its general manager Li Chunnong says 30,000 copies of the New Testament (Chinese-English bilingual edition) are being printed for free distribution during the Games. The Beijing Christian Council has placed an order with Amity to reprint 10,000 copies of the bilingual Bible edition to be distributed in the Olympic Village, Li says. NOTE from Bro Rick: Pray that the Bibles would be available to Chinese citizens! Many Christians live a life no different than a non-Christian. Many Christians continue to ignore God in their everyday lives. Many Christians have forgotten what God has done for them. Many Christians focus on their physical needs instead of their spiritual needs. Many Christians choose to remain inactive, instead of working for the Lord. If you were accused of being a Christian, would there be enough evidence to convict you? You can listen to “Practical Atheism” here, or by clicking on the player below. Due to a technical error, Sunday evening’s sermon, “Give it up” was not recorded. Most of us only think about Eric Liddell as ‘the man who wouldn’t run on Sunday’, for whom about the movie “Chariots of Fire” was made. After his running career, he served as a missionary to Shandong Province, China. He was captured during WWII by the Japanese and died in a prison camp in Weifeng, China, in 1945, just five months before the camp’s liberation. 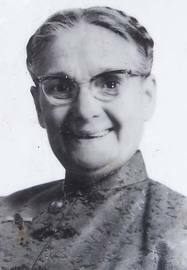 In a prisoner exchange bargain, his freedom was arranged by Winston Churchill, but he gave it up and let a pregnant woman leave instead. He was known as the “Flying Scotsman” and by his Chinese name, Li Airui, 李愛銳. I had the opportunity to visit Weifeng in 2004. I saw the camp and hospital where he died. There is a wonderful monument erected in his memory, but someone has defaced it by scratching out the cross at the top and the Bible emblem at the bottom. 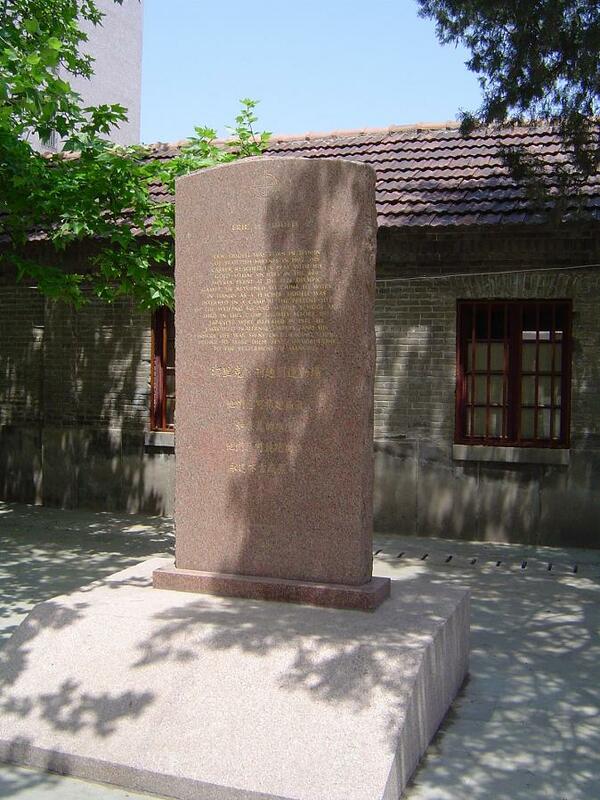 During the Cultural Revolution, the cornerstone of the hospital was defaced by the Red Guard. They committed a similar act on the monument to Lottie Moon in Penglai. One of the most moving monuments was the wall of names. 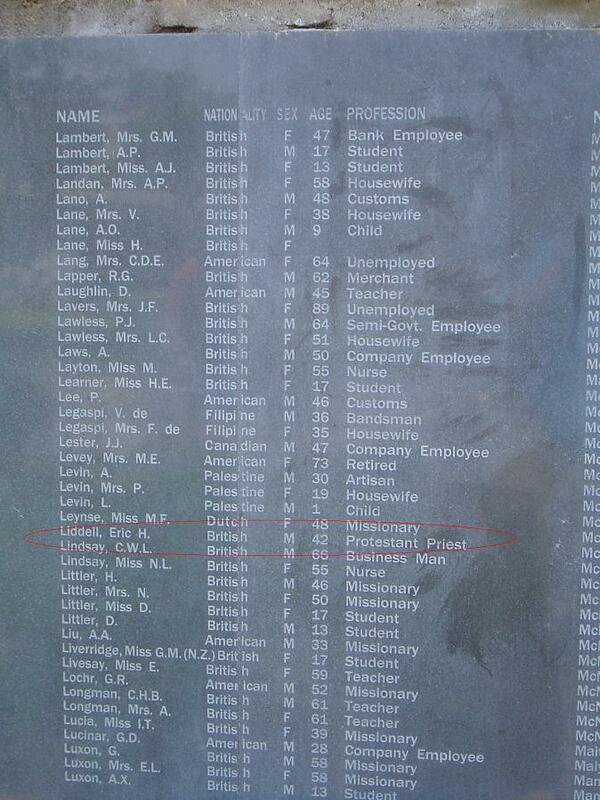 It listed everyone interred by the Japanese. Liddell’s name is, of course, listed as well. 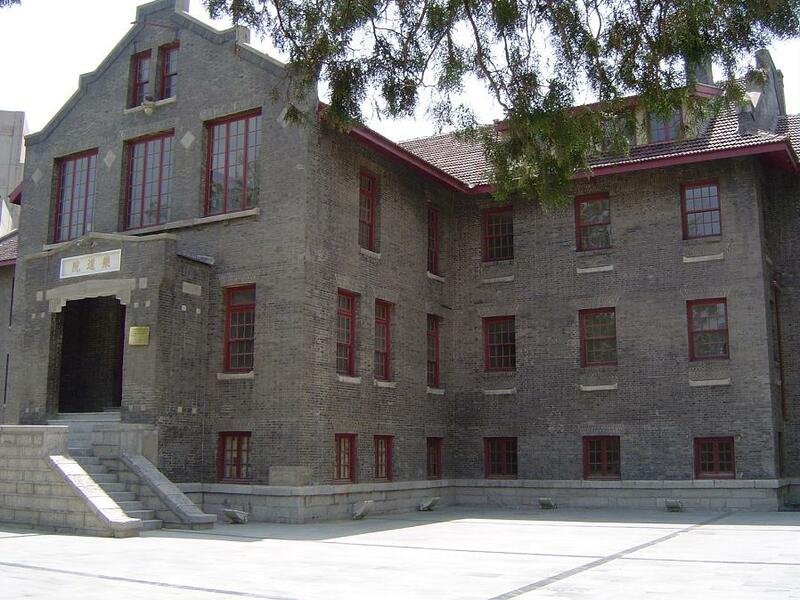 Hospital where Eric Liddell died in Weifeng Prison Camp in 1945.